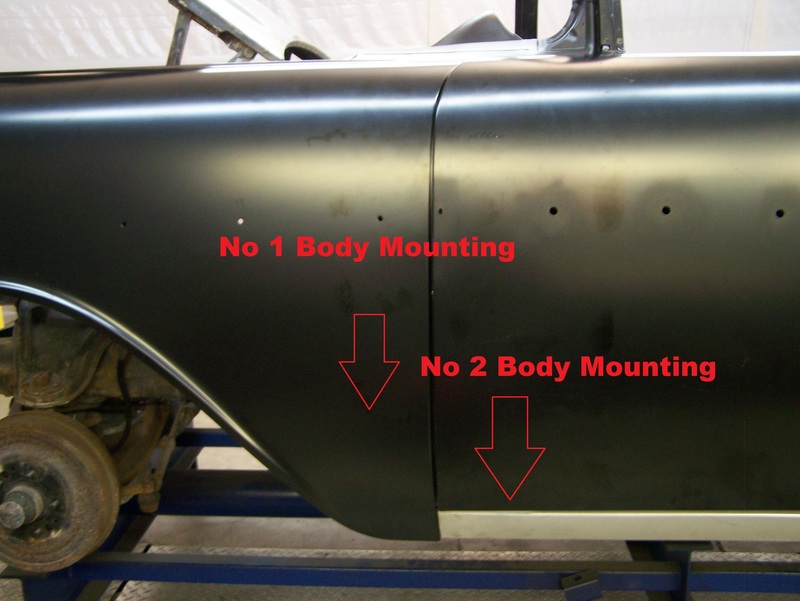 Super-wide gaps between the hood and fenders to the cowl top and doors can be a frustrating problem on both original and reproduction 1955-57 Chevy bodies. With the front fenders adjusted all the way back to fit the doors, and the doors fitting the quarters and rockers properly - the gaps can still be far too wide. Remember, a 1955-57 Chevy body is bolted to a rigid steel frame/chassis and that proper body fit can only be achieved via proper shimming of the body to the frame. Before you begin, the car should be sitting on all 4 wheels/tires or supported at each wheel with jackstands of equal height. 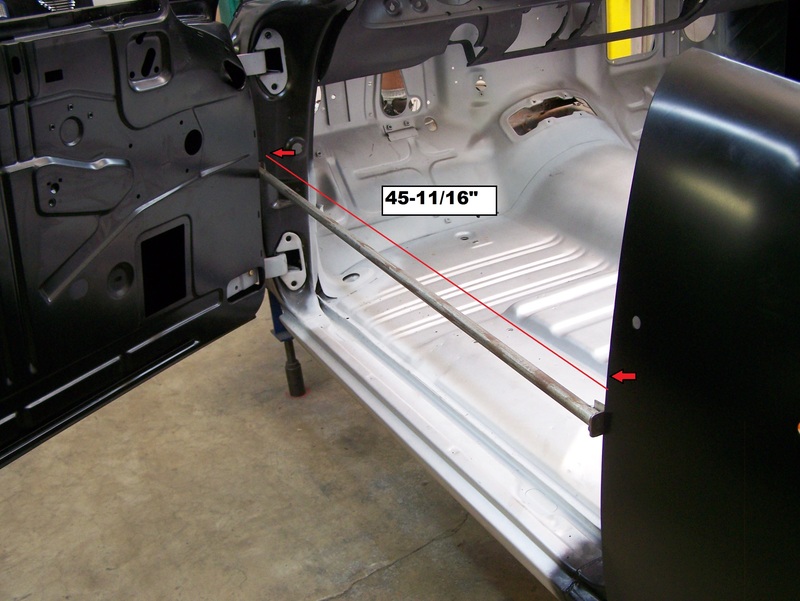 The door opening on all 1955-57 2-door cars should be 45-11/16" when measured between the flat area on the main A-pillar at the height of the dome light switch and the first step of the quarter at the rear of the door. If this opening is too tight, that means the cowl/firewall needs to be tilted forward until the proper measurement is achieved. We use a simple piece of steel conduit cut to the right length to check the door opening - this is far more accurate than using a tape measure! 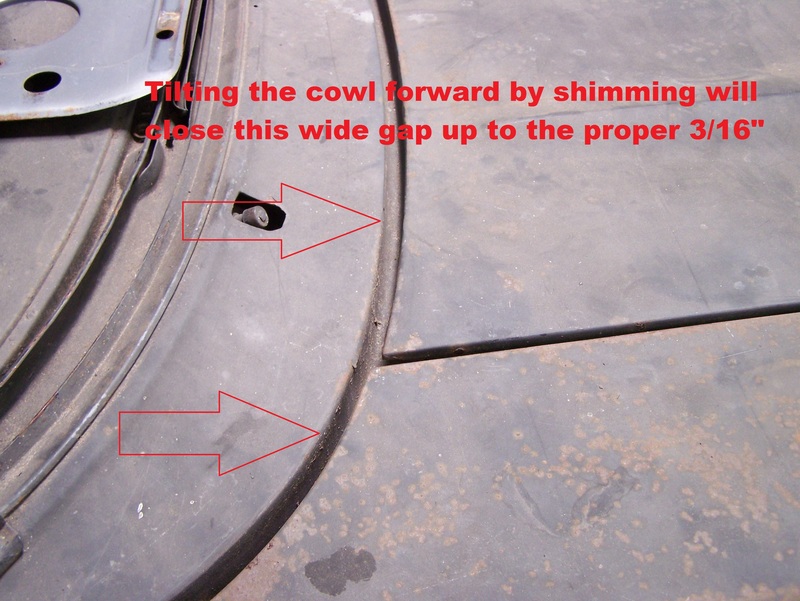 For cowl angle, you'll need to add/remove shims between the body and the frame at No 1 Body Mounting and No 2 Body Mounting. To move the cowl ahead, which will increase the distance between the A-pillars and the quarters, you'll need to remove shims at No 1 Body Mounting and add shims at No 2 Body Mounting. Experiment with adding or removing shims until the distance we measured in the door opening is 45-11/16" or slightly more. When you do this, the door gap at the quarter will go haywire - the rear of the door will rise above the top of the quarter. That can easily be corrected by adjusting the door on the hinges. With some patience and skill, you'll be able to achieve excellent gaps between the front end sheet metal and the cowl/firewall and the doors by adjusting the entire cowl assembly as we have done here. The number of shims added/removed will very likely be different on the left and right side of the car.